Look ahead to 2020 for a third series of domed or curved-shape commemorative coins from the United States Mint. As direction by Congress, the U.S. Mint issued curved baseball coins in 2014 and it will release curved Apollo 11 coins in 2019. Curved basketball coins are next. The Naismith Memorial Basketball Hall of Fame Commemorative Coin Act, numbered H.R. 1235, passed the House Sept. 25 and passed the Senate Dec. 18. Provided President Trump signs the Act into law, which is expected, the U.S. Mint in 2020 will strike and sell coins in gold, silver and clad to recognize the 60th anniversary of the Naismith Memorial Basketball Hall of Fame (www.hoophall.com). Update: President Trump signed the bill into law on Dec. 21, 2018. Their reverse or tails side would depict a basketball. A competition would determine a common obverse or heads side design that must be "emblematic of the game of basketball." Under H.R. 1235, a surcharge of $35 per gold coin, $10 per silver dollar and $5 per clad half-dollar would be added to each coin sale. Collected surcharges would fund an endowment to enable increased operations and educational programming of the Naismith Memorial Basketball Hall of Fame. On Dec. 21, 1891, James Naismith introduced the game of "basket ball" to his physical education class in Springfield, Massachusetts. In 1959, the Naismith Memorial Basketball Hall of Fame was founded and dedicated to the game’s creator Dr. James Naismith in Springfield, MA, "The Birthplace of Basketball," and became the first and only museum to honor the game at all levels around the world. Looking forward to the Apollo coin and the Basketball edition. 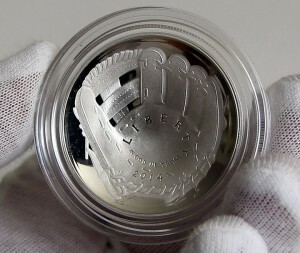 I was lucky enough to catch the operator at the Mint at just the right time when the web site was basically scuttled from the demand for the baseball coin and receive four silver and two gold mitten/baseball gems. That said, the mintage is just too high.